Please Note: Any person/students with a SubClass 500 Visa cannot enrol to do any courses here at ACTAC. Please Note: Postage Fee for Distance/ Work Books Cert III & IV $99 Diploma $149. Wanting to start your career working with children with a child care course? This nationally recognised childcare course online is flexible, self-paced and an affordable way to study the Certificate III in Early Childhood Education and Care! 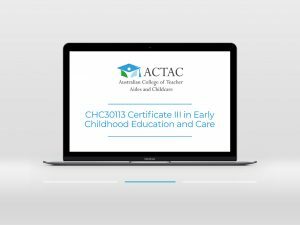 Take a look at ACTAC’s cert 3 in childcare. ACTAC’s CHC30213 Certificate III in Education Support is the leading nationally recognised entry level teacher aide course for those wanting to work in the classroom supporting a teacher as an integration aide, SSO or teacher aide. 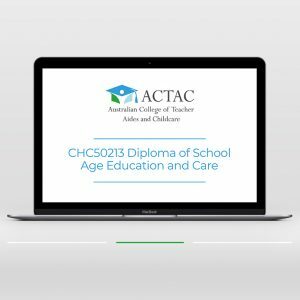 ACTAC is a specialist college providing teacher aide courses online or by distance in a flexible and affordable way. Wanting to study an OSHC course? Wanting to start or further your career with an outside school hours care course? The nationally recognised CHC40113 Certificate IV in Education Support is the entry level qualification for OSHC services. Study this leading teacher aide course with ACTAC, the specialist college providing nationally recognised teacher aide courses online and by distance. The CHC40213 Certificate IV in Education Support is the leading industry qualification for those wanting to work as teachers aides. Study ACTAC’s Diploma in School Age Education and Care online or by distance (with hard copy text books) for just $1499! Work in an OSHC service as a supervisor or service operator with the Nationally Recognised qualification specifically designed for Out of School Hours Care.